This article is about the 1969 Major League Baseball season only. For information on all of baseball, see 1969 in baseball. The 1969 Major League Baseball season was celebrated as the 100th anniversary of professional baseball, honoring the first professional touring baseball team, the Cincinnati Red Stockings. It was the first season of what is now called the "Divisional Era", where each league of 12 teams was divided into two divisions of six teams each. The winners of each division would compete against each other in a League Championship Series, then best-of-five, to determine the pennant winners that would face each other in the World Series. 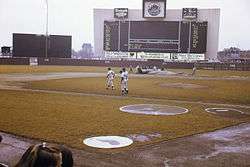 In a year marked by the second expansion of the decade, the New York Mets and the Baltimore Orioles faced each other in the 1969 World Series. Having won the N.L. East Division with a league-best 100–62 record, and sweeping the N.L. West Division Champion Atlanta Braves in three games in the first National League Championship Series, the "Miracle Mets" became the first expansion team to win a pennant. They faced the A.L. East Division Champion Orioles, holders of the best record in baseball (109–53), who swept the A.L. West Division Champion Minnesota Twins in three games in the first American League Championship Series. The upstart Mets upset the heavily favored Orioles and won the World Series title in five games. In an effort to counteract a trend of low-scoring games, Major League Baseball adopted two measures during the Baseball Winter Meetings held in December 1968. The strike zone was reduced to the area over home plate between the armpits and the top of the knees of a batter. Also, the height of the pitching mound was reduced from 15 inches to 10 inches, and it was recommended that the slope be gradual and uniform in every park. A save became an official MLB statistic to reward relief pitchers who preserve a lead while finishing a game. Symington drew up legislation to remove baseball's anti-trust exemption, and threatened to pursue its passage if Kansas City did not get a new team. The Leagues agreed and moved expansion up to 1969, with the AL putting one of its new franchises in Kansas City. Ewing Kauffman won the bidding for that franchise, naming it the Kansas City Royals, after the local American Royal livestock show. The other AL team was awarded to Seattle. A consortium led by Dewey Soriano and William Daley won the bidding for the Seattle franchise, and named it the Seattle Pilots, a salute to the harbor pilots of the Puget Sound maritime industry. In the NL, one franchise was awarded to San Diego, California; the other to Montreal, Quebec, resulting in the first MLB franchise outside the United States. C. Arnholdt Smith, former owner of the AAA Pacific Coast League's San Diego Padres, won the bidding for the San Diego franchise, also naming it the Padres. Charles Bronfman, owner of Seagram, won the bidding for the Montreal franchise, naming them the Expos, in honor of the World's Fair that year. This was the last NL expansion until the 1993 season. As part of the 1969 expansion, each league was to be split into two divisions of six teams each, with each league holding a best-of-five League Championship Series to decide the pennant. The AL was divided purely along geographic lines, but when it came to assign divisions in the NL, the Chicago Cubs and St. Louis Cardinals insisted on being placed in the same division with the New York Mets and Philadelphia Phillies, on the basis that a schedule with more games with eastern teams would create a more lucrative schedule. Thus, Atlanta and Cincinnati were placed in the NL West. This alignment also addressed concerns that putting the league's three strongest clubs—St. Louis, San Francisco, and the Cubs—in the west would result in divisional unequity. The Padres and Expos each finished with 110 losses and at the bottom of their respective divisions. The Royals did better, finishing 69–93 and in fourth in the AL West. Even though the Pilots managed to avoid losing 100 games (they finished 64–98, last in the AL West), financial trouble would lead to a battle for team control, ending with bankruptcy and the sale of the team to Bud Selig and its move to Milwaukee, Wisconsin as the Milwaukee Brewers for the 1970 season. The legal fallout of the battle would lead eventually to the expansion for the 1977 season. The modern MLB logo was first used in 1969. A special silhouetted batter logo was created by Jerry Dior to commemorate the anniversary, and is still used to this day. It has served as inspiration for logos for other sports leagues in the United States—most notably the National Basketball Association, which used the silhouette of Jerry West to create their current logo, unveiled after the 1970–71 season as part of the 25th anniversary of their own founding. The pennant races in the American League lacked drama. In the east, the Baltimore Orioles won 109 games and won the division by a whopping 19 games over the defending world champion Detroit Tigers. The surprise team was the Washington Senators. Under new manager Ted Williams, they went 86–76; it was their first winning season since joining the league in 1961. The Western Division race was a little closer, but the Minnesota Twins led most of the season and were never really threatened in winning the division by 9 games over the Oakland Athletics (who were the only other west team to finish over .500). The National League, on the other hand, was very dramatic. The Chicago Cubs won 35 of their first 50 games, and on August 16, they led the New York Mets and St. Louis Cardinals by 9 games. But the Mets proceeded to win 37 of their last 48 games while the Cubs went 20–28 in the same time period and the Mets won the division by 8 games. The West was even crazier. With 3 weeks to play in the season, 5 teams were all within 2 games of each other. The Houston Astros were the first to drop out of the race, losing 8 of 10. With two weeks to play, the San Francisco Giants led the Los Angeles Dodgers and Atlanta Braves by ½ game while the Cincinnati Reds were 2 games back. The Dodgers then lost 8 in a row and 10 of 11 to fall to 4th place. The Braves then went on a 10-game winning streak, ultimately clinching the division over the Giants on the next to last day of the season with a 3–2 win over the Reds. For the Giants, it was the 5th year in a row they would finish in 2nd place. ↑ "Spirited Trading On 'Frisco Board". The Sun. December 4, 1968. p. 24. Retrieved January 31, 2011. ↑ Holtzman, Jerome (May 2002). "Where did save rule come from? Baseball historian recalls how he helped develop statistic that measures reliever's effectiveness". Baseball Digest. Retrieved April 8, 2012.